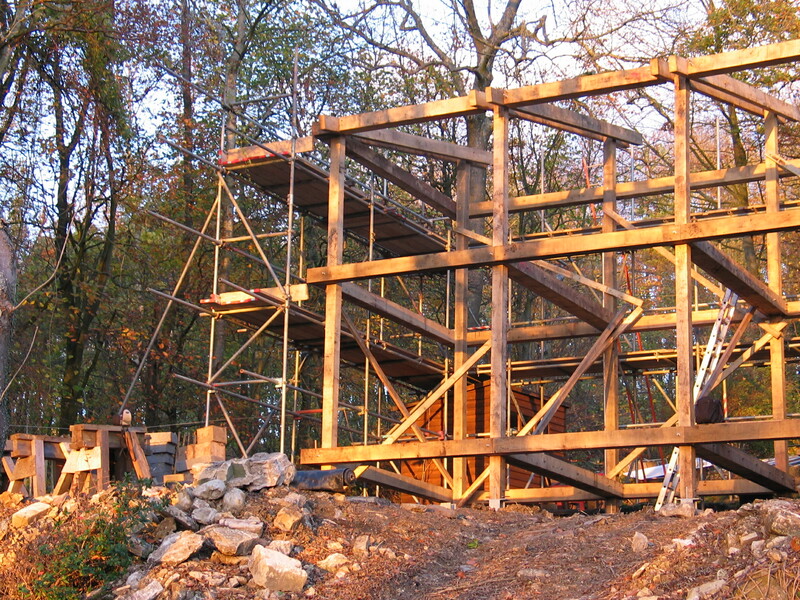 Moonshine is an example of a modern timber frame design. It was designed by architect Piers Taylor, whose aim was to create a hidden ‘castle in the air’ as a family home. Piers used a combination of modern design and construction such as steel bolts and large sliding doors in combination with the sturdy green oak beams and columns. The structure created a light and airy extension to the original 18th century house. 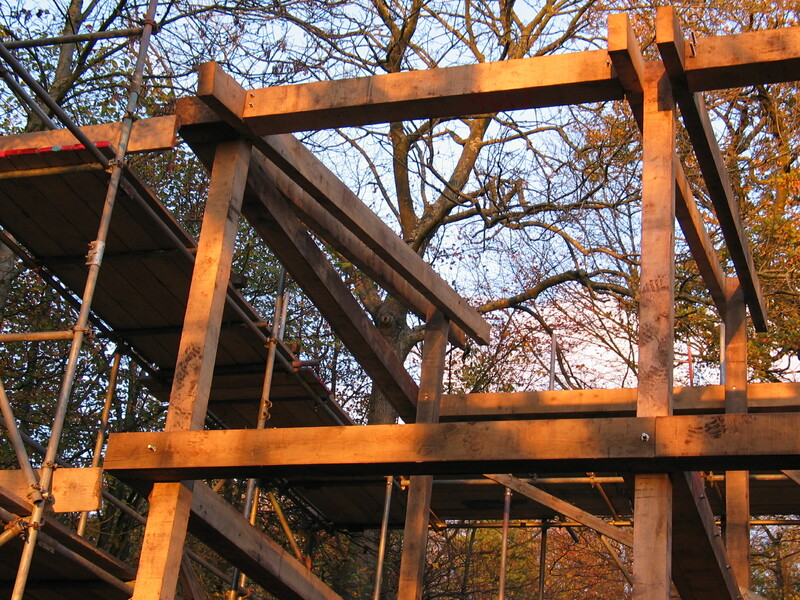 The project was challenging, requiring us to transport the huge oak beams onto the off-road site. As Piers Taylor said: “Getting the oak frame down was the hardest; some sections weigh nearly a ton and had to be brought down on a trolley. 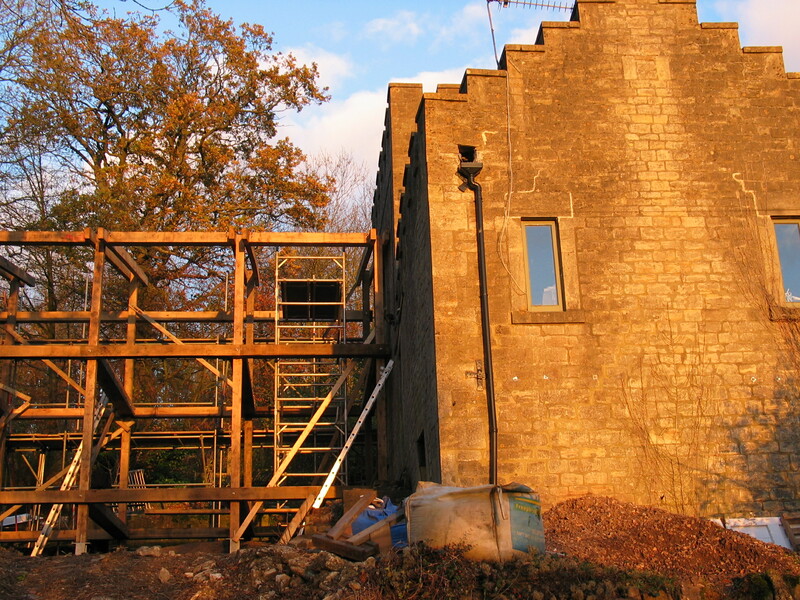 It was madness but we managed it.” With a crane brought in to position the timbers, the frame was raised and now stands solidly, supporting the glass walls and plywood sections. This brief case study features our images of the build stage. You can see stunning images of the completed building, which has featured in many reviews and supplements, in an article from an American magazine and on the architect’s website. Moonshine was shortlisted for the 2005 Wood Awards and a RIBA Town and Country Award in 2007, as well as winning the 2009 Architectural Journal Small Projects Award.